We are Christ-centered, mission-focused Evangelists, Candidates, volunteers and donors, rooted in the Anglican Communion, who are committed to serving, reaching and loving broken, rejected, sad, disconnected and hurting people with a message of hope, love and joy. We are at the center of evangelism and on the edges of society. We specialize in working outside church buildings through addiction centers, urban farming, jails and prisons, café ministries, streets and back alleys, schools, senior centers, hospitals, nursing homes, housing developments and more as we need. Church Army USA is a 501(c)3 non-profit organization. We are an Affiliated Ministry of the Anglican Church in North America and a member of the Anglican Global Mission Partners. To assist us in following the Lord, Church Army is blessed with the godly leadership of an Anglican Bishop and a Christian Board of Directors. Bishop Robert Duncan provides godly leadership and is a liaison between Church Army and the Churches that it serves. The Board gives generously of its time and treasure to direct, and provide for, the ongoing ministry of Church Army. 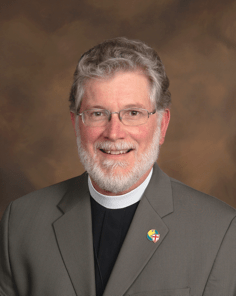 Several Board members are members of the Anglican Church in North America (ACNA) but the Board also reflects a variety of Christian denominations and churches as the Board endeavors to direct Church Army in the ways of Jesus Christ. We are very thankful for their wisdom and guidance. Welcome to Church Army USA! I served as a parish Rector for 25 years. During most of that time I had never heard of Church Army USA. When I did, I was hooked. Church Army's ministry is to equip the church so that it will be more effective in evangelizing; to reach the least, the last, and the lost with the gospel of Christ and bring them into the fellowship and ministry of the church. Lives are being saved by the work that the Lord is doing through Church Army USA. We operate a cafe which serves as a gathering place for hurting people to share their pain and seek help. 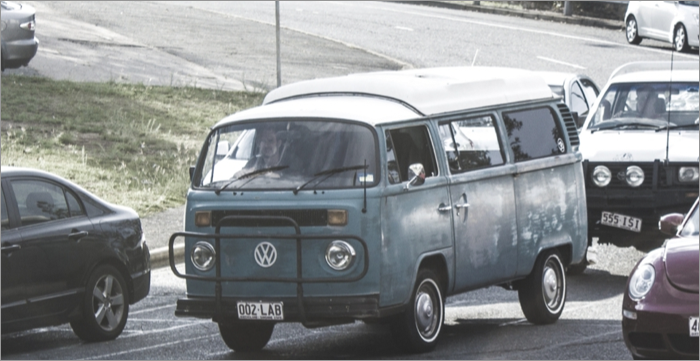 We also employ people in recovery from drug and alcohol purposes for their lives. Fire and Rescue Squads have asked us to help make their rescue personnel. more sensitive to the thinking of people who overdose on heroin. The local methadone clinic has asked us to come and bring the gospel to the people they are treating. We are going into jails to talk about Jesus with in-mates. Police officers are assisting us as we provide underwear for the homeless. Veterans administrations are asking for our help in rehabilitating US military veterans suffering from PTSD. We engage in this work because the Lord has reminded us that whatever we do unto the least of His brethren we do unto him. Likewise, whatever we do not do for the least of his brethren we do not do to Him. I invite you to partner with us in this work as we seek to reach a lost and hurting world with the redeeming work of Jesus Christ. Reach out for ministries in your area, to lend a hand, learn more, or to support us! 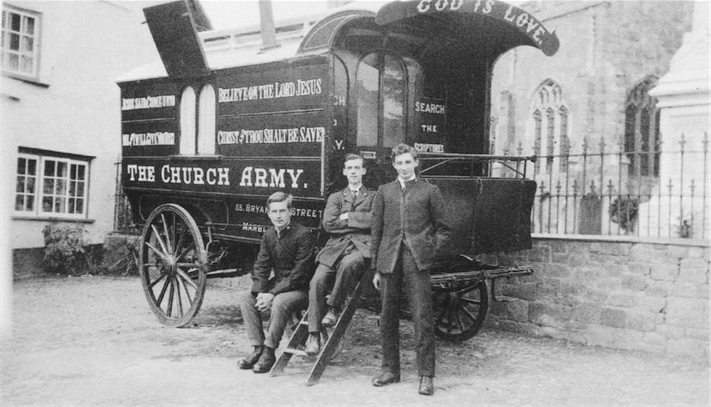 The Church Army was founded in England in 1882 by the Rev. 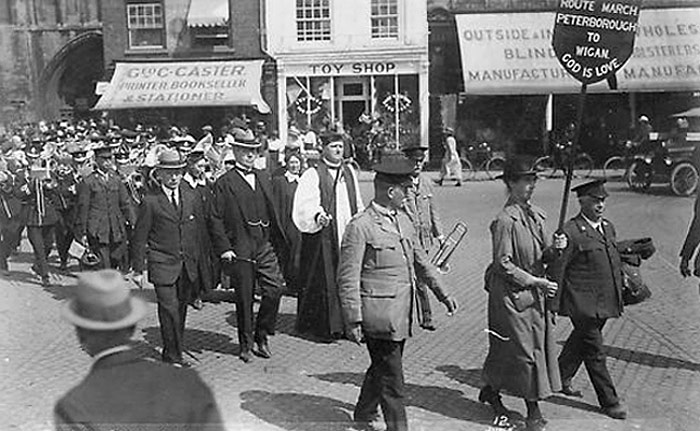 Wilson Carlile, who banded together an orderly army of soldiers, officers and a few working men and women, whom he and others trained to act as Church of England evangelists among the outcasts and criminals of the Westminster slums. 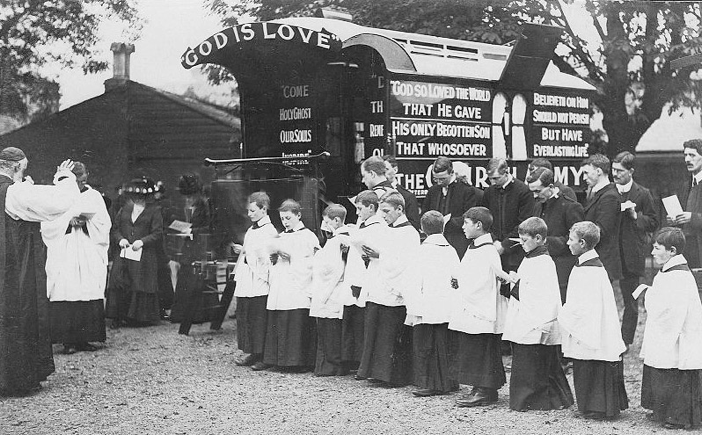 As a curate in the parish of St Mary Abbott, Kensington, Carlile had experimented with unorthodox forms of Christian meetings and witness, going to where coachmen, valets and others would take their evening stroll and holding open air services, persuading onlookers to say the Scripture readings, and training working people to preach. Previous experience had convinced Carlile that the moral condition of the lowest classes of the people called for new and aggressive action on the part of the Christian Church and that this work was most effectively done by lay people of the same class as those whom it was desired to reach. As the work grew, a training institution for evangelists was started in Oxford with F S Webster as Principal, but soon moved (1886) to London, where, in Bryanston Street near Marble Arch, the headquarters of the army was established. Marie Carlile, Wilson Carlile's sister, was a frail woman who left a life of elegance for the tough, austere life of training women in 1888, followed by the first "Rescue Shelter" for women in 1891, and continued in the mission for fifty years. Today, Church Army USA is a society of trained and commissioned evangelists in the Anglican Church. Their aim and purpose is winning persons to Christ, by providing the Church with trained, disciplined and socially concerned evangelists who shall: reach the least, the last, and the lost; equip others to “do the work of an evangelist” and further evangelize by ministering where others cannot. Church Army is at work in Pennsylvania, Missouri, New Mexico, Florida, Connecticut, and Maryland to bring the help of Christ and the comfort of the gospel.